The 2019 FIM Supersport 300 World Championship season will officially kick off at Motorland Aragón (Spain) from 5th-7th April 2019, but reigning WorldSSP300 Champion Ana Carrasco has already been stealing the headlines, as she has been nominated for the Laureus World Sports Awards as Breakthrough Star of the Year. The Spanish rider has been selected with five other sportsmen and sportswomen who have made an astonishing impact in different international sports last year. Waiting to know the name of the winner of the prestigious award which will be announced on the next 18th February in Monaco, Ana Carrasco revealed her goals and her dreams for the future in a press conference that was held after her nomination. As the Spanish newspaper El Español reported last week, Carrasco expressed her hope to become the first woman to win in MotoGP™: “I don’t know when a woman will be able to win in MotoGP™, but I hope it will be me the first female to achieve such a result”. 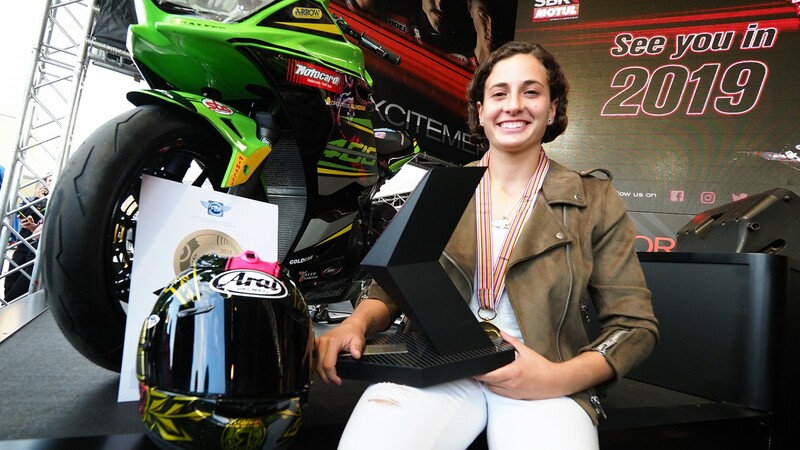 Becoming the first ever female rider to win a world championship title last year, Carrasco already set an incredible record and for 2019 she looks forward to repeating the outstanding achievement defending her WorldSSP300 title and taking the crown for the second time in her career. Heading into her third season in WorldSSP300, Carrasco will be counting on an experienced team as Provec Racing this year, which is the same squad that line up four times WorldSBK champion Jonathan Rea in WorldSBK: “I have a lot of confidence this year. I will be riding with one of the best teams in the world. Everyone is working hard on the bike. I think that we will arrive at the start of the season on a great level”. Working on every aspect of her career, Carrasco moved to Barcelona where her team is based to be able to make quick progress and focus on every details of her preparation: “I am 21 years old, so I am still very young. There is a lot of room for improvement! I think I will be able to join MotoGP™ in four or five years”. Follow Ana Carrasco’s heading into the 2019 FIM Supersport 300 World Championship season as reigning World Champion, all with the WorldSBK VideoPass.